The rugby codes have been dealt a double blow. With the news of Dave Brockoff’s passing yesterday came this morning’s death of legendary rugby league figure Rex Mossop. Affectionately known as The Moose, Mossop passed away at Sydney’s Royal North Shore Hospital, at the age of 83. Mossop was a dual international, having played eight Tests for the Wallabies before switching to rugby league in the 1950s. He played 163 games as a no-nonsense front rower for Manly, played nine Tests for Australia, and went on the 1959 Kangaroo tour. For a whole generation of kids growing up in the 1970s, the Moose’s playing exploits were less known than his role as the commentator for Seven’s Big League. From 1974 to 1982, 6.30pm Sunday nights was must-see TV as Mossop and sideline eye Barry Ross brought the match of the round into our lounge rooms. Mossop would present the sports report on Seven news but would withhold the result of the rugby league match to be broadcast directly after. Instead he’d give a teaser by showing the “Hunter Douglas” try of the match, which was sometimes a fair indicator as to the eventual winner of the game. Controversy Corner also included the Commonwealth Bank Passing Competition, where two players from that week’s game of the round would appear in their playing gear and pass a ball at a target. The highest points scorer was awarded a range of gifts including the Pelaco shirt, the Meapro ham and the Patra fresh orange juice. It was prime-time Sunday nights where The Moose roared loudest. His commentary was enthusiastic, often blunt, and the English language got a fair work out. My English teacher at the time re-named tautologies “Mossopisms” and always said her favourites were “That’s so incredulous I can scarcely believe it” and “Norths played badly” (with apologies to Bears fans). On one particular broadcast, circa 1978, Mossop was commenting on a Canterbury player whose name escapes me and he said to sideline eye and statistician Barry Ross, “I believe this is the young fella’s debut, Barry.” Ross replied, “No Rex, he played last week.” There was then about three minutes of dead air time, where the game went on with no commentary. A group of us watching agreed that Mossop had left the commentary booth to stride down to the sideline and put Ross straight about correcting him on air. Mossop was a regular spectator at Manly’s Graham Reserve on a Saturday, watching junior football (soccer). He stood behind my goal one day and applauded a save I made. For a 13 year old sports nut, there was no higher praise at the time. It was not the Moose’s only brush with the round ball code. By 1983, Channel Ten had won the rights to broadcast rugby league. The Socceroos played a three match series against the touring England side, and Channel Seven broadcast the games, with the unlikely duo of Mossop and Johnny Warren heading the commentary. These were Frank Arok’s first games in charge of the national team. Mossop returned to his first love when he moved to Channel Ten to head their broadcast team soon after. He remained involved until retiring from the commentary booth in 1990. He made a surprise return to the TV on Andrew Denton’s sports show Live and Sweaty in 1991, where he became a regular on a revamped Controversy Corner, having the time of his life as the old school bloke arguing the sporting point with Elle McFeast, Lex “The Swine” Marinos, Debbie “Skull Of Rust” Spillane and “Crackers” Keenan. Away from the camera, Mossop garnered headlines when he made a citizen’s arrest of a man outside his North Manly home. The man was returning from Reef Beach, a designated nudist beach and had made the mistake of not bothering to kit up before he walked to his car which just happened to be parked near Mossop’s house. In a quote that brings a broad grin to this day, Mossop declared that he didn’t need “the male genitalia rammed down my throat” which was reason enough to “collar” the naked man. If any proof of Mossop’s influence on the collective psyche of a generation of people was needed, consider this. While writing this article, a female friend of mine phoned. When I told her what I was doing she presented a whole slew of memories of The Moose, despite not being a league fan, and rarely watching TV. 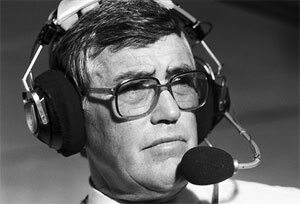 In the 1970s, Rex Mossop was the doyen of TV sport. Manly players will wear black armbands and there will be a minute’s silence on Monday night before their clash with great 70s rivals Parramatta. There could be no more appropriate opponent in the circumstances. And if the game produces a bit of biff, a lot of forward progress and a high, high Gary Owen or two, The Moose will probably be watching from somewhere with a knowing smile.